Inside a Compton gym, clouds of smoke hang in the air as fighters warm up for a jiu jitsu tournament. Besides rolling, practicing submissions, stretching, and chatting with their coaches, the competitors are also using marijuana. For many of people, doing anything besides melting into the couch with a bag of chips after smoking pot seems like a tall order. The fighters of High Rollerz BJJ have stronger constitutions—and a higher tolerance for being high. The main rule at High Rollerz is simple: every fighter has to use marijuana before their match. Operating on an honors system, there aren’t any rules that dictate how high they need to be, just that they must smoke out before their respective bouts. The winners of each bracket get the championship title for their division and a pound of weed. 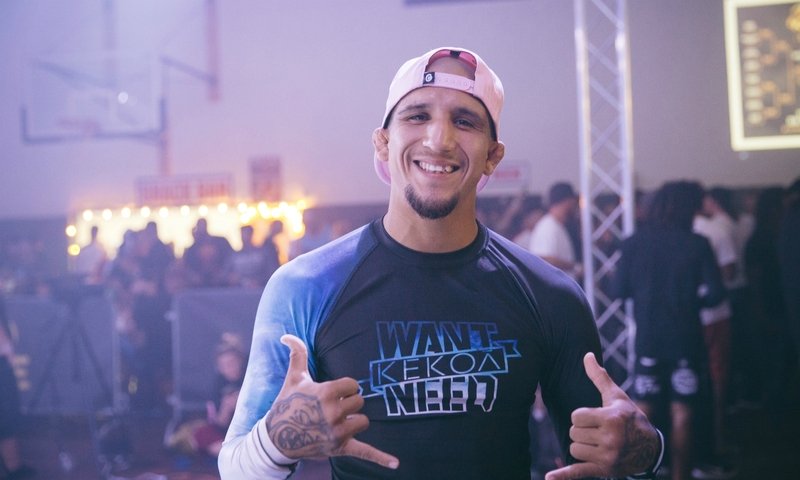 Created by Matt Staudt (of PR firm the Staudt Agency) and Lonn Howard, High Rollerz aims to break down antiquated cannabis stereotypes and introduce high-level jiu jitsu to people who otherwise might not know much about it. 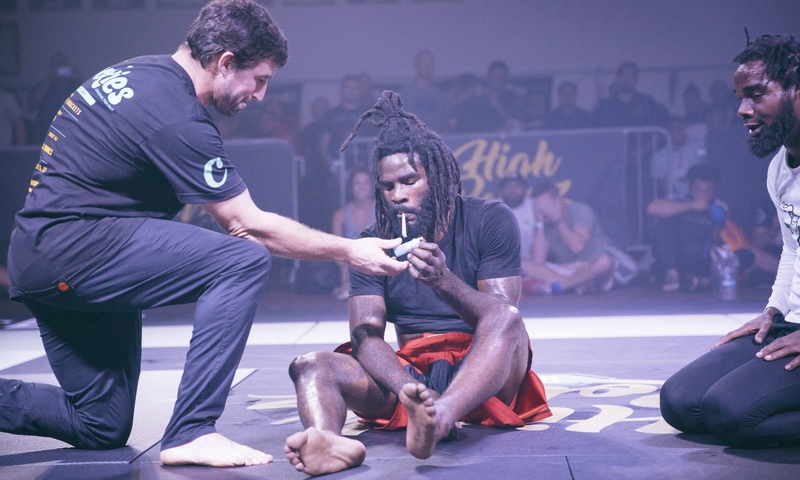 Howard, a jiu jitsu practitioner himself, found that smoking cannabis before a BJJ training session or competition quelled his anxiety and helped him focus. The highly strategic martial arts discipline, which Staudt refers to as “human chess,” requires an extraordinary amount of technique and skill. Many top-level fighters, including black belts Nick and Nate Diaz (UFC), are strong proponents of the benefits of cannabis and CBD, especially for athletes. “Lonn [Howard] came up with the idea and the name, and when he approached me with the idea, I loved it. It totally made sense,” said Staudt. 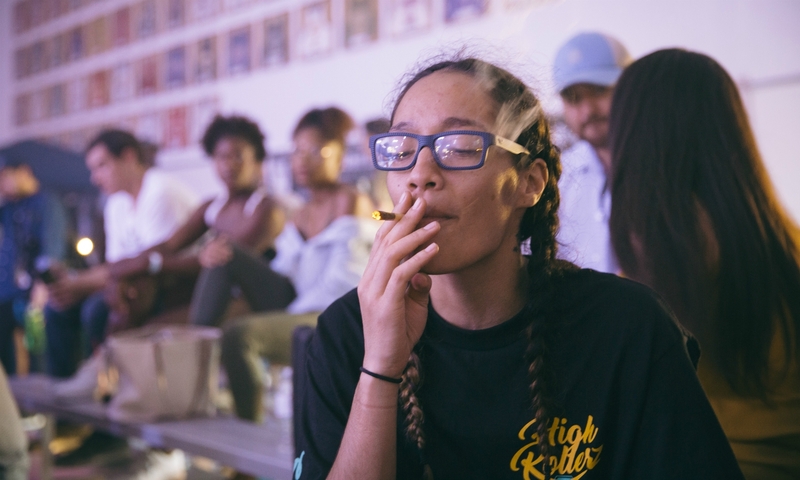 Staudt, whose PR firm works with cannabis brands and MMA fighters, found sponsors for the event, and in June of this year, just a couple months after its conception, the first ever High Rollerz BJJ tournament took place. What started out as the little tournament that could turned out to be a success. “We had an incredible response, way beyond and better than what we ever imagined,” said Staudt. The tournament generated such a huge buzz that they made plans for future High Rollerz BJJ tournaments, the second of which was held on Sunday, September 9. “It took two months to fill all the [competitor] spots for the first one. When we announced the second one, the spots filled out in ten hours,” Staudt says.